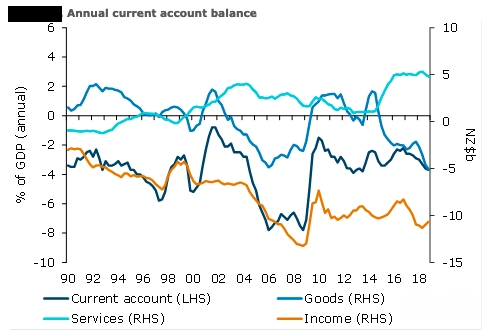 New Zealand’s annual current account deficit came in a touch narrower than what markets had initially anticipated during the fourth quarter of last year at 3.7 percent of the gross domestic product (GDP). Further, the country’s net international liability position deteriorated by 3.4 percentage points of GDP to 57 percent, largely owing to negative valuation changes of offshore assets. To the extent that global equities have since recovered, this should reverse in Q1. The unadjusted quarterly current account deficit narrowed in Q4 (from $6.2 billion to $3.3 billion). The goods deficit narrowed as seasonal agricultural production gave exports a boost and imports remained broadly stable. Meanwhile, the unadjusted services balance flipped from deficit to surplus reflecting the seasonal lift in inbound tourists, and the income deficit narrowed marginally to $2.5 billion, ANZ Research reported. The annual deficit widened to $11.0 billion in Q4 from $10.6 billion in Q3, which saw the current account as a share of GDP tick up 0.1 percentage point to 3.7 percent, which is just a smidgeon above its historical average of 3.6 percent. In seasonally adjusted terms, the quarterly current account deficit was unchanged from Q3 at $2.5 billion, $0.4 billion narrower than we had pencilled in. Data revisions accounted for $0.1 billion of the surprise, while a smaller widening in the goods deficit, a stable services surplus (versus expectations for a minor narrowing), and narrowing income deficit (versus expectations for a slight widening) explained the rest, the report added.